Florida’s people depend on their court system to make fair, reliable, and prompt case decisions. The administration of justice requires deliberate attention to each case, a well-defined process to minimize delay, and the appropriate use of limited resources. 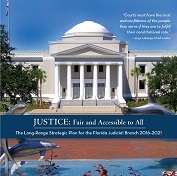 It is important that the Florida judicial branch continue to implement practices which utilize resources effectively, efficiently, and in an accountable manner while continuing its commitment to fairness and impartiality. 1.1 Perform judicial duties and administer justice without bias or prejudice. 1.2 Ensure the fair and timely resolution of all cases through effective case management. 1.3 Utilize caseload and other workload information to manage resources and promote accountability. 1.4 Obtain appropriate and stable levels of funding and resources for courts throughout the state. 1.5 Encourage the use of consistent practices, procedures, and forms statewide. 1.6 Increase the use of constructive and non-adversarial resolutions in family law cases. Florida’s courts are committed to equal access to justice for all. However, litigation costs, communication barriers, lack of information, complexity, biases, and physical obstructions can create difficulties for those seeking to access the courts to obtain relief. The judicial branch must strive to identify and remove real or perceived barriers to better provide meaningful access to the courts. 2.1 Minimize economic barriers to court access and services. 2.2 Provide useful information about court procedures, available services, forms, and other resources. 2.3 Ensure that court procedures and operations are easily understandable and user-friendly. 2.4 Collaborate with justice system partners and community organizations to deliver appropriate services. 2.5 Reduce communication and language barriers to facilitate participation in court proceedings. 2.6 Promote the use of innovative and effective problem-solving courts and alternative dispute resolution processes. The judicial branch’s legal authority is a grant by the people, and public trust and confidence in the judicial branch is at the heart of maintaining a democratic society. Promoting public trust and confidence in the courts enhances the effectiveness of court actions, strengthens judicial impartiality, and improves the ability of courts to fulfill their mission. Improved communication, collaboration, and education efforts will better inform the public about the judicial branch’s role, mission, and vision. 3.1 Enhance understanding of the purposes, roles, and responsibilities of the judicial branch through education and outreach. 3.2 Promote public trust and confidence in the judicial branch by delivering timely, consistent, and useful information through traditional and innovative communication methods. 3.3 Communicate effectively with all branches and levels of government on justice system issues. 3.4 Coordinate with justice system partners to share information and promote services which further the interests of court users. The administration of a state court system serving millions of people each year is a complex undertaking. Managing the court system resources and personnel is further complicated by growing customer expectations, ever more complex legal issues and cases, and rapidly changing technology. The judicial branch’s ability to assess its environment and respond appropriately will enhance the broad range of court services and technology solutions designed to meet the needs of court users. 4.1 Protect all judges, court personnel, court users, and facilities through effective security, emergency preparedness, and continuity of operations plans. 4.2 Safeguard the security, integrity, and confidentiality of court data and technology systems. 4.3 Create a compatible technology infrastructure to improve case management and meet the needs of the judicial branch and court users. 4.4 Improve data exchange and integration processes with the clerks of court and other justice system partners. 4.5 Modernize court processes through automation and expanded self-service options for court users. 4.6 Secure sufficient financial resources for technology and innovation to meet current needs and future challenges. 4.7 Strengthen and support judicial branch governance and policy development. Justice depends on the competence and quality of judges and court employees. These professionals handle complex legal issues and court procedures, address difficult legal and ethical issues, and face increased expectations from court users. Providing advanced levels of education and development will enable those who work within the courts system to effectively perform the challenging work of the courts and meet the needs of those whom they serve. 5.1 Promote public trust and confidence by maintaining high standards of professionalism and ethical behavior. 5.2 Attract, hire, and retain a qualified, ethical, and diverse workforce. 5.3 Provide timely education and training to judges and court employees to ensure high-level performance. 5.4 Expand the education of judges and court employees to recognize and understand various perspectives of court users on relevant and emerging topics. 5.5 Develop technology-based approaches to complement existing education programs for judges and court employees. 5.6 Ensure judges and court employees have the technological skills necessary to perform more efficiently.